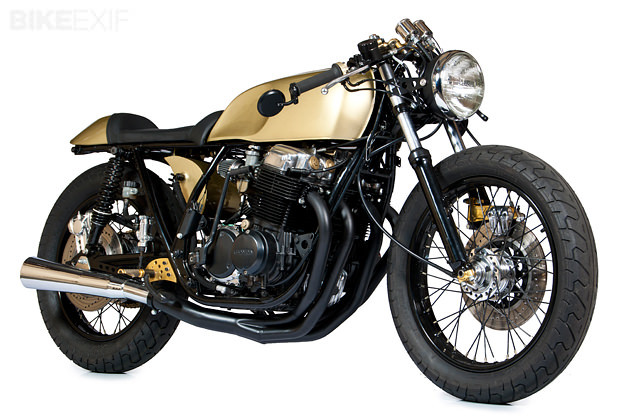 Resplendent in black and gold, this CB750 is a looker. 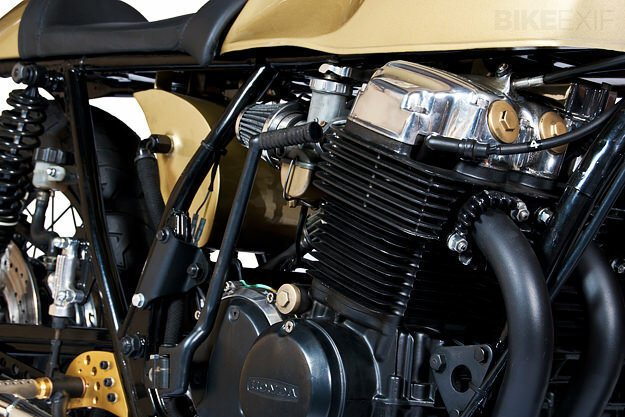 One of the biggest visual changes is the new seat unit, crafted made from ¼” steel round bar and sheet steel: Kott designed it to reflect the angularity of the Honda’s fuel tank and accommodate an integrated turn signal/brake light. Next to receive attention was the tank. “The 750 Super Sport tank is one of the most attractive stock Honda fuel tanks, but I needed to create more leg room for the rider.” So Kott added knee indentations, creating a teardrop aesthetic that he carried over into the custom oil tank design. 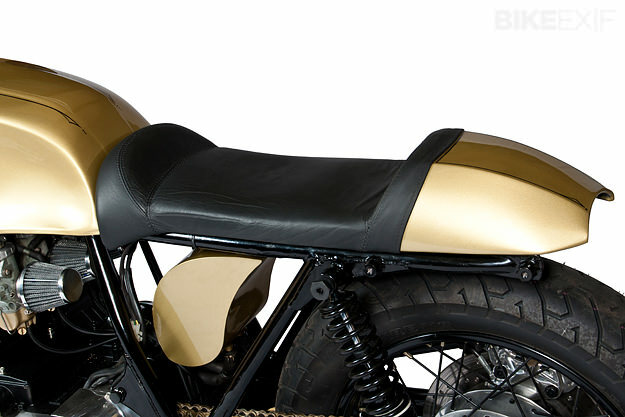 Kott also eliminated the stock plastic inner fender, so the oil tank now does double-duty as an inner fender and splashguard, mirroring the curvature of the rear tire. New rearsets improve the riding position and the Honda’s rear master cylinder has been swapped out for a late 80s Yamaha FZR600 item. “The rearset plates were cut and shaped by hand from aluminum plate and attached to a steel tab welded to the frame of the bike,” adds Kott. 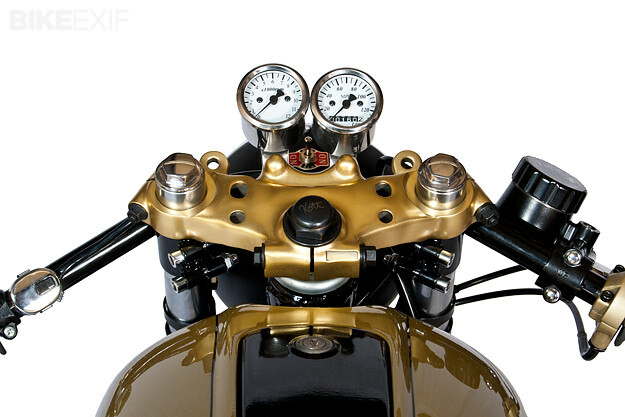 Up front, the mini speedo and tach are attached to the stock mounting holes for the original ignition switch, on the cut-and-flattened top triple clamp. To create a more fluid line, Kott lathed a pair of 2-inch standoffs to lower the height of the gauge faces; he also drilled the headlight to allow the drive cables to pass through the bucket, eliminating kinks in the cables. The wheels have been treated to black oxide spokes, in tune with the other finishes on the bike—including black powder coat, gold anodizing and chrome. Like all Kott builds, this Honda retains a lovely vintage aesthetic but gets a useful boost in performance and functionality. 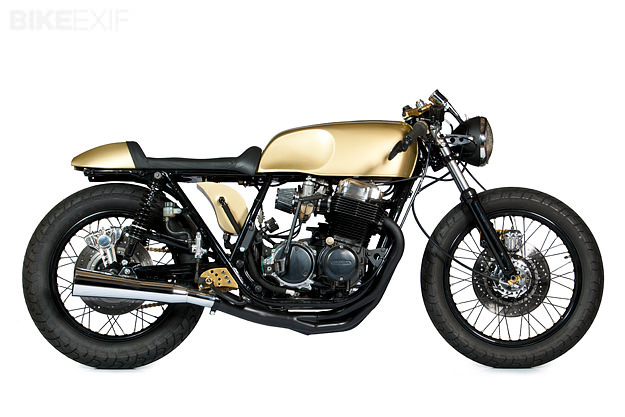 They say it’s hard to improve on an original—especially an iconic bike like the CB750—but Kott knows just how to do it. 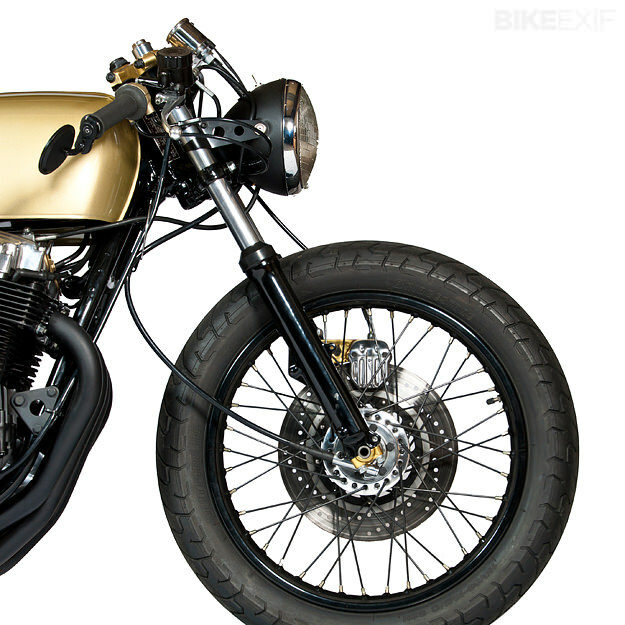 Check out his other builds via the excellent Kott Motorcycles website, or read up an interview with the man himself on the brilliant Megadeluxe.